Preparing foods on a gas grill is much easier and faster than on a charcoal grill. However, charcoal grilling is still a favorite method of grilling and searing foods, for obvious reasons. Nothing beats the ‘charcoal flavor’ and cracking sounds of charcoal. They wake up nostalgic feelings and all those lovely memories you have made with your partner, family, and friends. But, to enjoy flavorful grilled food and grilling alone, you need the best charcoal grill, so it’s great you found our article. We present to you the 5 best charcoal grills in 2019 to suit everyone’s “burning” needs and means. First, let’s take a quick look at the comparison table so you know what models we will talk about. From a classic charcoal grill to a premium bbq smoker, to a cheap charcoal grill, our list is carefully compiled to satisfy our readers. Read on to find the best fit for you. Ample cooking area of 363 sq. ft. The Weber 14407001 charcoal grill is as good as it gets for that price. It offers a convenient, safe, and easy way to grill all kinds of foods for your family. If you want the outdoor grill that is also compact and doesn’t cost a fortune, meet the Weber Original Kettle Charcoal Grill. Weber is known to produce the best models for charcoal grilling, so going classic with this model is always the right decision. The Weber charcoal grill is an easy and fun way to grill your favorite food. It has a built-in lid thermometer, allowing you to monitor the temperature with ease so you know when it’s the best time to start grilling. With a cooking area of 363 square inches, this grill offers plenty of space to grill the meat and veggies for your family. Thanks to the round design and a plated steel cooking grate, this grill offers both direct and indirect grilling. Also, multiple vents let you have better control over the heat, so you can reduce or increase the flame, depending on the food you’re grilling. Two glass-reinforced nylon handles with tool hooks gives you the chance to keep the utensils within reach. When choosing a charcoal grill, safety is one of the major concerns. 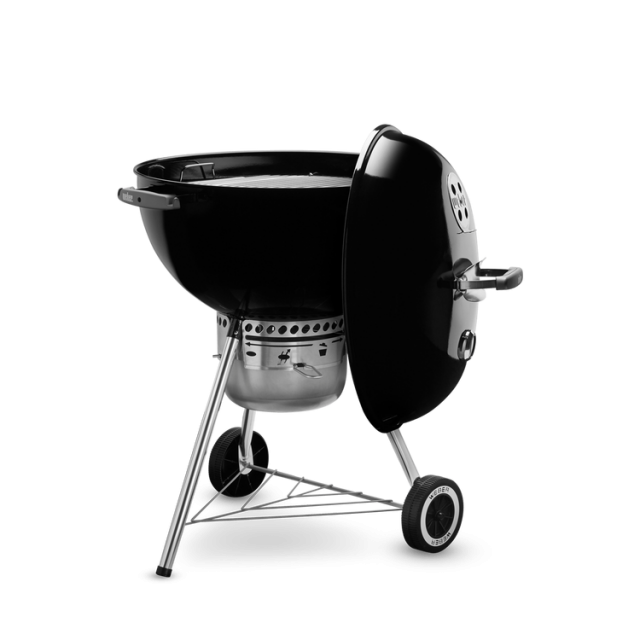 The Weber charcoal grill features a lid handle with a heat shield to enable stress-free opening and closing. Coming for a trusted brand, this grill is made to withstand years of use. Thanks to the heavy-duty steel frame, and porcelain-enameled steel bowl and lid, the grill is durable and sturdy. In addition, the aluminum damper is rust-resistant. The thing we really love about this model is easy cleaning. The removable aluminum ash catcher will keep ash in one place. So removing ash after you’ve done grilling will be mess-free. The One-Touch cleaning system helps the grill to maintain the clean look even after numerous uses. Now that we’ve mentioned the appearance of the grill, we must say that this model looks simple yet beautiful. It even comes in three colors – black, copper, and green. Thus, you can choose the one that best blends with your outdoors. The last good thing worth mentioning is portability. Coming with durable wheels, this grill is easy to move around when needed. Now, let’s mention the downsides of this grill. First, ash catcher is hard to remove, so people with weaker hands will find it hard to remove it with one hand. Second, assembly instructions aren’t written in the text; instead, they are presented in graphics. Obviously, this isn’t encouraging for those who haven’t assembled any grill before. All in all, this is one decent Kamado charcoal grill, perfect for a family. It’s versatile, and has some useful features such as folding metal shelves and ash catcher, making it a great addition to your backyard. Here we have a Kamado grill at an affordable price. Given the price into account, you cannot expect wonders from this grill. But, you can expect to grill and smoke some flavorful food for your family and friends from time to time. Now, let’s talk about why this unit is good enough for you. We love the Kamado design of this unit – it’s great for getting delicious cooking results. Triple-wall insulation maintains heat, while the dampers allow you to adjust heat to the level needed. The Char-Griller charcoal grill can withstand the temperature from 200F to 700F and the cast iron cooking grates generate even heat. 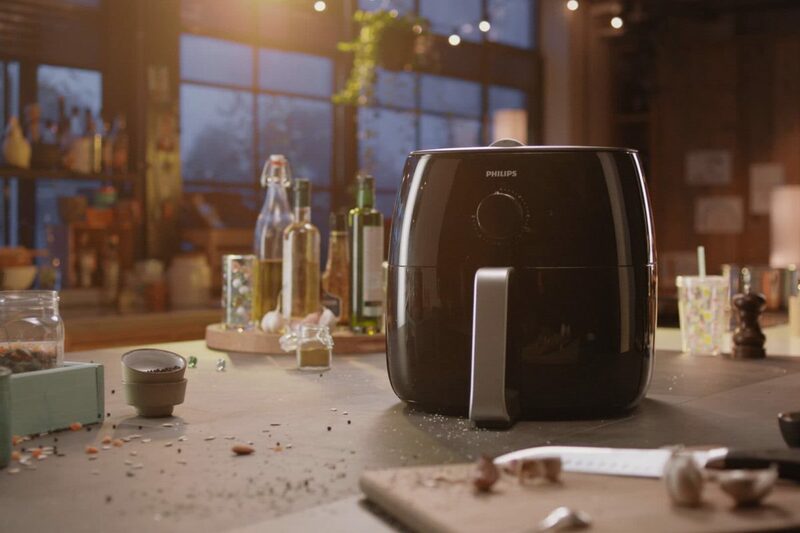 So, you can have perfect burgers, steaks, and veggies every time. Of course for that, you will have to be good at grilling. And please note that learning to adjust the perfect temperature has a learning curve. The Built-in temperature gauge is decent and will enable you to check the temperature without actually having to open the lid and lose the heat in the process. The cooking area of 314 square feet isn’t as big as with other grills, but it’s still good. You can grill and smoke large cuts of meats without hassle. On the other hand, if you feel like eating some pizza, you can place the heat reflector plates on the grill. It’s not bad for the price, huh? Another handy feature is the workspace. The two folding side shelves are great when you need to prepare food for grilling. And when you don’t need this extra workspace anymore, just fold the shelves back into the table and they won’t be in your way anymore. We were surprised by the sturdy construction of this unit. The body is made of 22 gauge steel, while the cart is made of cylindrical steel with rubber wheels. The locking casters allow you to transport the grill with ease. The interior surface is finished in porcelain coated steel and the exterior features a powder coated steel finish. There is a slight concern with the exterior – it will quickly rust if left uncovered. So, consider buying a cover for the grill if you plan to leave it outside. Like most charcoal grills, this one also features a handy dump ash pan to allow for simple and quick cleanup. So, you will no longer have “Cleaning the grill is so complicated” kind of excuse for not using the grill. Large cooking area, extra storage space, and a low price make this outdoor grill a good value for the money. 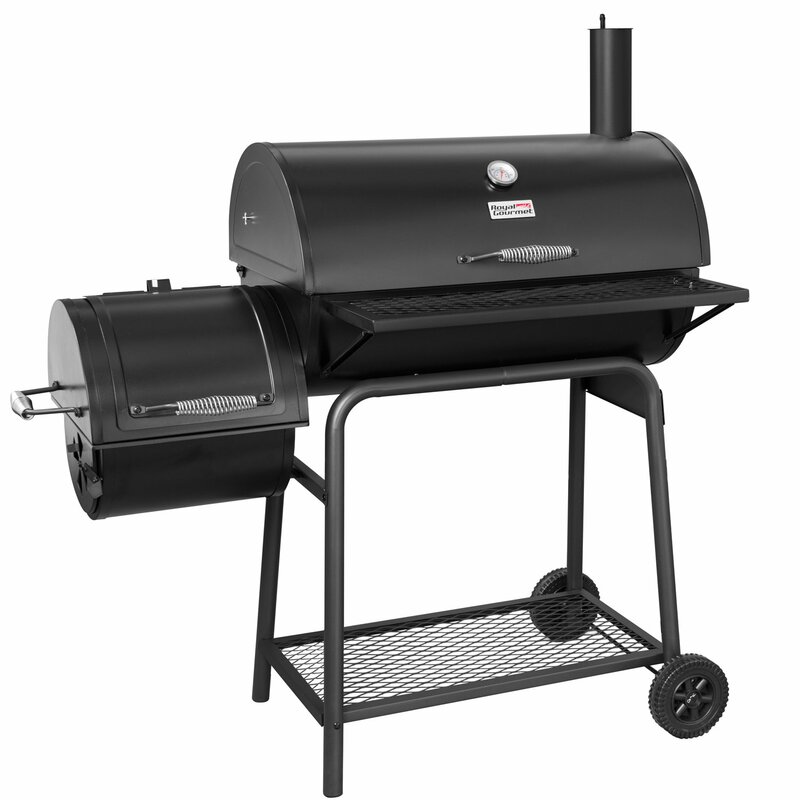 It is a perfect start for grillers who have yet to learn before purchasing the premium BBQ grill and smoker. After going through numerous charcoal grill reviews, we’ve decided to give this one a try. And we glad that we did because the Royal Gourmet Charcoal Grill with Offset Smoker is the unit worth mentioning. We grilled and smoked a variety of foods on this grill, and we were pleased with the results. Well-known BBQ flavor and juicy meat is our favorite combination – and this mate brought us exactly that. This grill offers the biggest cooking area compared to others on our list. With a total of 620 sq. inches cooking surface, you can easily cook food for 6-7 people. So, if you love inviting friends to BBQ, this grill will help you make super tasty foods. In addition, it will save your time, since you will grill more food in one go. You can grill meat in the main chamber, and prepare side dishes in the offset smoker. Oh, and there is also a warming rack that gives more cooking space. Being installed slightly higher, this rack is perfect for grilling veggies. We found that controlling the temperature on this unit is fairly easy thanks to the height-adjustable charcoal pan and a built-in thermometer. And of course, there are also air vent and side door to optimize air flow. It won’t take you much to learn how to best control the temperature and air with this grill – which is a nice bonus. You definitely won’t have to worry about having extra useful space with this grill. It comes with front and bottom shelf, providing plenty of room for utensils, spices and other things you might need or want while grilling. Constructed of heavy-duty steel, the Royal Gourmet Charcoal Grill is robust and quite heavy. 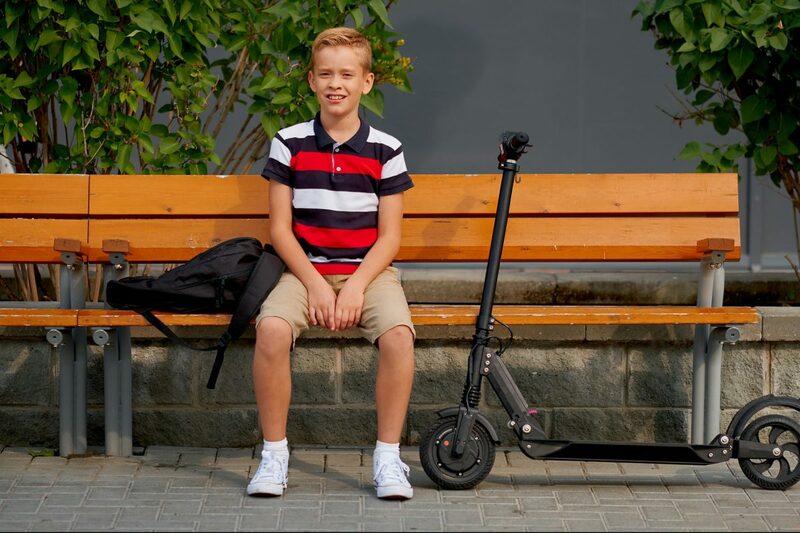 But, luckily the unit features two wheels to make transport much easier. So basically when you want to grill, just roll the grill where you want it, and get to work. And when you’re through with grilling, you can store it conveniently and protect it from the elements. The grill comes with the heavy-duty lid and cool-touch spring handle. You will love this handle because it will allow you to lift the lid with confidence while keeping your hands safe. While the black finish looks modern and stylish, the downside is that the paint might peel off much sooner than you’d expect. 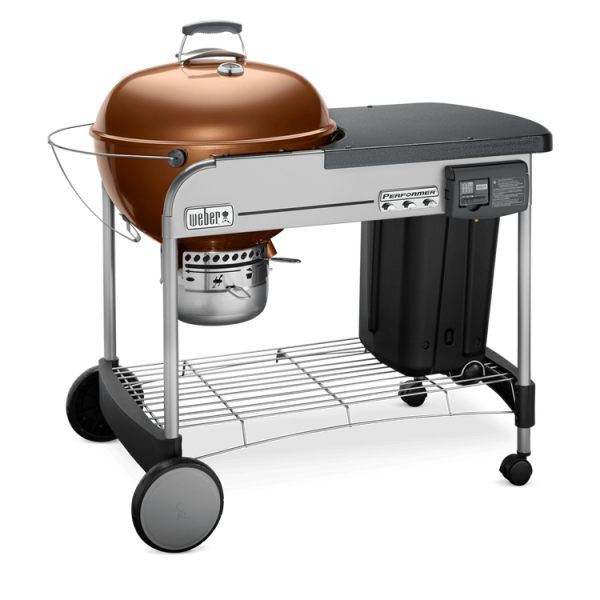 The Weber Performer Deluxe Charcoal Grill comes with all the features to make your grilling easy, safe, and fast. Those features justify the higher price of this unit, making it a worthy investment. While the Weber Original Kettle Charcoal Grill is a classic, those who want to take grilling up a notch, consider this model the best charcoal bbq. The Weber Performer Deluxe Charcoal Grill has all the useful features you need so you can fully concentrate on that food in front of you. The design of this grill is similar to that the Original Kettle 22 inches Grill. This model also features porcelain-enameled bowl and lid, heavy-duty steel cart frame, and rust-resistant aluminum damper, making it durable. While the cooking apparatus is also 363 inches, the unit is placed into a sturdy wheeled work table. So, you also get a work surface, a wire bottom shelf and tool hooks to keep the food and other items close to you. This will greatly save your time, as you won’t have to go back and forth to your house to get the food, and utensils you need. But, wait to hear the best handy feature of this unit – a charcoal storage. Attached to the side of the table, the storage will keep charcoal just where you need it. Now let’s talk about another great thing about this model – the Touch-n-Go Ignition System. Thanks to this system, you can light the charcoal with just one touch of the button. Sounds good huh? When it comes to cooking, lid thermometer, and a damper makes it a whole lot easier since you will be able to control the heat and monitor temperature. Still, the feature that you will really appreciate is a removable backlit LCD cook timer that allows you to cook the food with precision. Just like the basic model, this one offers Aluminized steel One-Touch cleaning system for easy cleanup. But, with this model removing ash catcher won’t be hard at all. In fact, just press the button and remove the ash catcher. With two durable all-weather rubber molded wheels and two locking casters, you can roll the grill over your patio and not worry whether it will stay there. The slight concern with these casters is that they only work on smooth and hard surfaces. 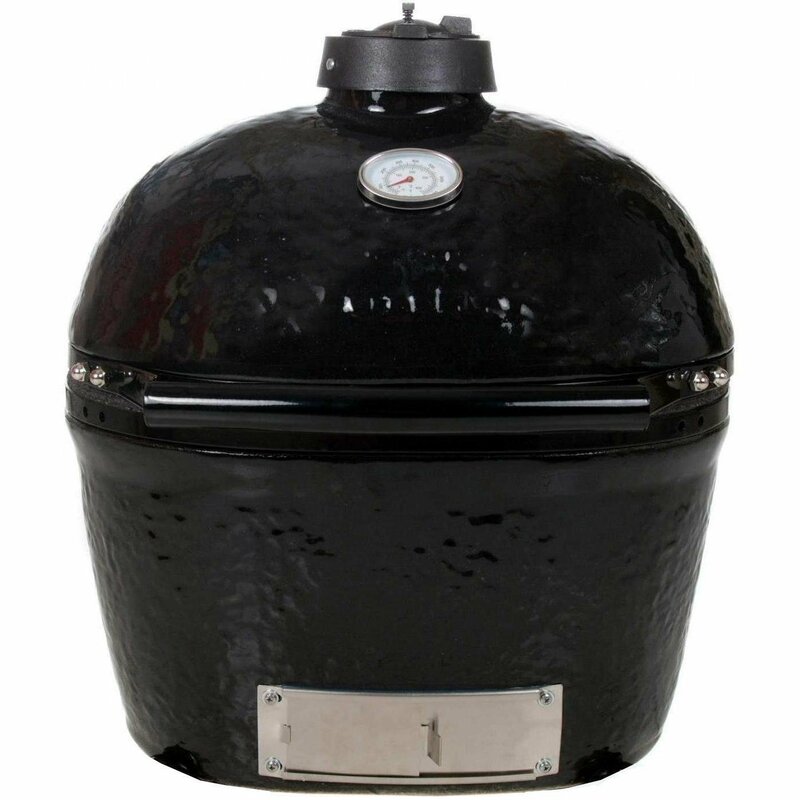 The Primo Ceramic Charcoal Grill is a good choice for home chefs who want a high-quality charcoal smoker grill that is also versatile. Dining outdoors is one of those simple pleasures that you and your family can have whenever you want with a regular charcoal grill. However, if you’re the type that loves to make all kinds of foods for your family, we think that “the most versatile ceramic grill” on the market would fit the bill. 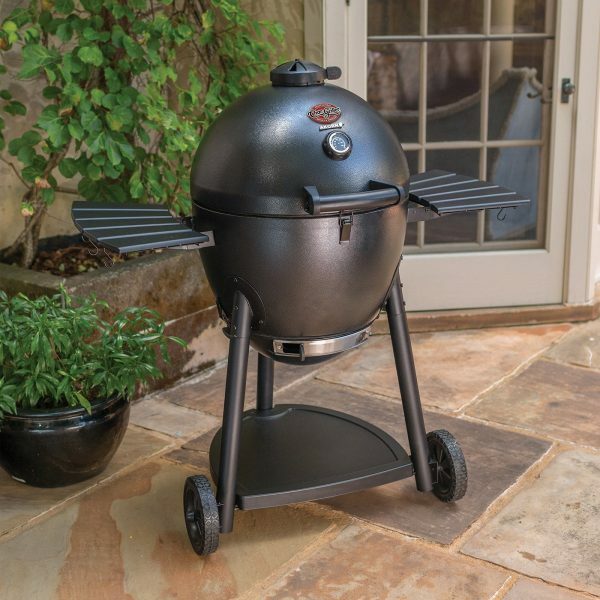 Thanks to its careful design and oval shape, this unit offers you the chance to grill, smoke, roast, and bake. Let’s see why the Primo Oval Junior is your best bet. The standard cooking area is 210 square inches, which is already enough space for preparing the food for your family. But, if you want to invite your friends to BBQ, or simply make a real feast then you can extend the cooking area up to 360 square feet. You can use/combine upper racks, firebox divider, heat reflector plates and lower racks for the best results. The cast iron divider can be placed into the grill if you want to cook on direct and indirect heat simultaneously. With the upper racks, you can cook different kinds of foods at the same time, hence double cooking time. Just be sure to place the meat on the bottom rack because it needs to be close to the fire. Then on the upper rack place the veggies and other foods that are cooked at a low temperature. The upper rack also is handy if you want to keep the food warm. Then again, if you want to turn this grill into an oven combine the lower racks and with heat reflector plates. However, keep in mind that these additional items aren’t included with the unit so you have to buy it on your own. If you are good at grilling, then you will love using the Primo Oval Junior Grill. Everything about it is designed to deliver delicious results. First, the bottom vent door and cast-iron chimney vent allow you to adjust the flow of air. Then, the Precision Thermometer will accurately read the internal temperature, so you know what to do next. The thermometer is also useful for conserving the heat since you won’t have to open the lid to check the temperature. While the ceramic body allows the grill to quickly heat up, Soft-Close Felt Gasket will ensure the grill retains the heat and moisture. As a result, the food will stay juicy and flavorful. Made of ceramic, this grill is pretty darn heavy, so you wouldn’t want to move it. We suggest you install it on the wooden table and leave it there. The grill features ceramic feet so you can place it on any inflammable surface without worrying. As far as durability is concerned, the grill is made of premium ceramic and is coated with a scratch-resistant, and lead-free porcelain glaze. You even get a 20-year warranty. 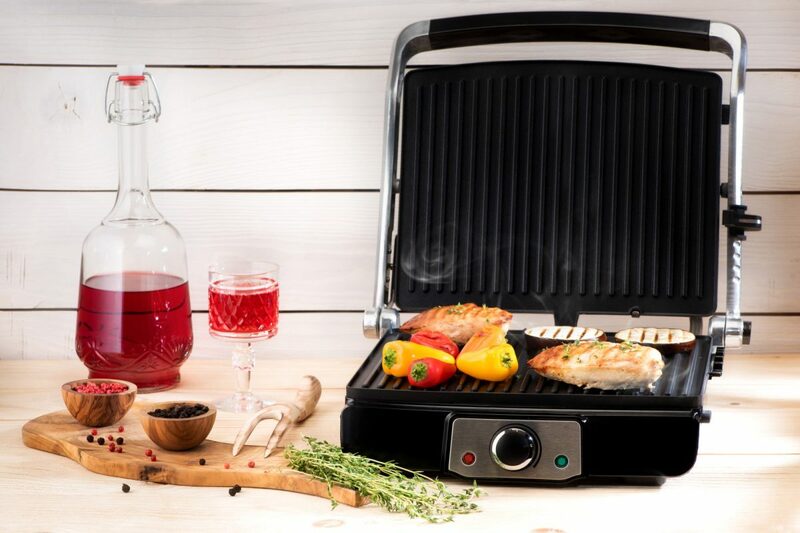 And there you have it grillers – 5 best charcoal grills 2019 that you can get. Although each grill we tested is good in their own way, we still have our favorite – the Weber Performer Deluxe Charcoal Grill. You just can’t beat the cooking performance and durability of this grill. It literally comes with all the features that contribute to easy, safe, and fast grilling, which is why we love it so much. This unit might be pricey, but it’s well worth it. Now, it’s about time to make that burning decision and choose the best charcoal bbq for you.